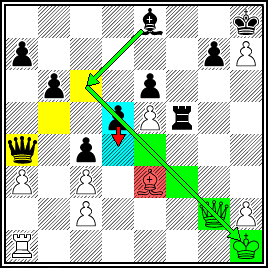 Ken Ho brought another chess diagram maker to my attention -- DiagTransfer. It looks like it gives you significant flexibility in highlighting specific squares and placing arrows on the board. You may want to check it out. It has been the conventional wisdom in the West for some time now that Soviet era chess players colluded during major international tournaments in order to sway their outcome. Now, in the spirit of Steven Levitt's "Freakonomics", economists Charles Moule and John Nye attempt to prove the case. The University of Amsterdam is seeking a PhD candidate to study "Development of cognitive expertise in chess." The appointment will be for a period of four years (one year plus a further three years after a positive evaluation) and should lead to a dissertation. The gross monthly salary will be in accordance with the University regulations for academic personnel. It will range from 1,933 Euros (first year) up to a maximum of 2,472 Euros (fourth year) gross per month. The envisaged starting date is 1 September 2006. Get your application in soon. Another up side, of course, is the trash talking. In regular face-to-face chess games, unless you're playing speed chess or a pick-up game in Washington Square Park, trash talking is discouraged. The tradition in chess has always been the non-verbal psych out. But it was never considered rude to trash talk in postal chess. Chessville puts the United States Chess League spotlight on GM Larry Christiansen of the Boston Blitz. Of course, we always like to point out that both Larry and Natasha are members of the Boylston Chess Foundation. As reported during NESN's Saturday broadcast of the Red Sox-Phillies game, Boston's rookie closer Jonathan Papelbon passes the time in the bullpen during the early innings playing board games, including scrabble and chess. My schooling was conventional, Dedham Public schools and Dedham High School, but then they tried to make an engineer out of me by sending me to Massachusetts Institute of Technology. The result was not too good. During the first year a half dozen of us, after playing a few games at Walker Memorial in Cambridge, would regularly trek across the bridge to Ye Olde Boston Chess Club on Ashburton Place or to various dives in the West End, not the least attractive of which was the Lighted Lamp operated by Boston's famous Ambrose Gring. Those were really the balmy days of chess in Boston. Well I remember listening to tales told many times over by John Barry, Will Miller, George Babbitt, and a host of others most of whom are no longer living. I seemed to have been a favorite with John Barry because I would talk chess and analyze with him until 4 A. M. in the morning after everybody else had either gone home or turned to a bridge game. At any rate I believe I learned most of my chess from Mr. Barry, and in 1922 attained to the club championship. An autobiography is supposed to contain a statement as to when one learned chess, although it's not clear as to why this is so important. However, for the sake of the record, I began playing at the age of about twelve. An older brother of a friend next door taught the two of us to play, and would play us both simultaneously blindfold at Queen odds. What I do think is important, however, is the time when he took us to Boston once to visit the Boston Chess Club which at that time was located in an alley off Boylston Street. I shall never forget the thrill it was to me to see for the first time the large club size pieces in action. Instinctively I seemed to feel that that was me. A friend of mine tells me that he had a similar experience on first visiting a stock exchange and seeing the ticker tapes in action. Curiously, all the rest of his life has been spent in the stock market. To continue my story, about 1924 Harold Morton had just won the championship of the Providence, R. I., chess club, and a purse was gotten up for a match to take place between Mr. Morton and myself for the championship of New England. Up to that time John Barry had been unofficially recognized as the strongest player in N. E., so, with his consent and approval it was logical that the winner of the match should hold that title. Thus, in 1924 I became the NE Champion and held the title until 1929 when Morton beat me in a succeeding match. Another match between us did not take place until about 1938 which Morton again won. After his death in 1939 the title came under the control of the N. E. Chess Association and has been decided by an annual tournament (usually held over Labor Day weekend) ever since, which is all to the good, since I am strongly opposed to the awarding of titles through private matches. 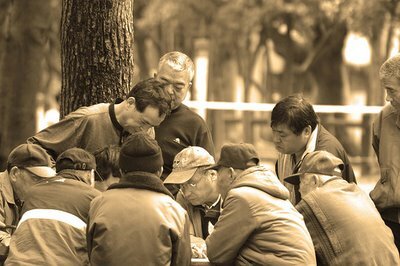 The tournament method is pre-eminently fair and much more attractive to both the players and the public. Thereby closes the local chapter in my chess career. At this time – say 1936 - I think that both Morton and myself - I know I did - thought that we were pretty good chess players. We were in for a rude awakening. In that year (1936) was held the first tournament for the Chess Championship of the United States, due to the retirement of Frank J. Marshall. I recall that after the first few rounds I kept figuring that I might still win the tournament, provided I won all of the remainder of my games. In fact, this went on for several rounds, before I finally gave up hope of first prize. After nine rounds I was relatively proud of my score, since I had three wins and six losses, while Morton had nine goose eggs in a row. However, we finished in a tie for last place, since in the remaining six rounds Morton got six draws, and it was my turn for goose eggs. I mention this experience in order to caution the reader that unless he happens to play regularly in the chess clubs of New York City, he shouldn't put too much store by his showing in the chess clubs of other cities. There is really a difference. In a considerable sense I feel that my serious chess playing did not begin until after 1936. Hundreds of hours I spent on opening analysis, with the result that there began forming in my mind the idea that by means of precise play White could perhaps emerge from the opening with just enough edge to win. Thus developed a small volume published in 1959 by the David McKay Co. of Philadelphia entitled "White to Play and Win", by Weaver W. Adams. 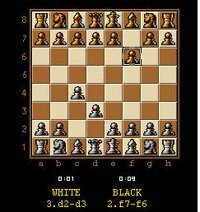 Forthwith, in a tournament at Dallas, Texas in 1940 I proceeded to lose all of my games playing white and win all of my games playing black! However, I still stick to my theory, and even under the handicap of bucking my own analysis (most writers sedulously avoid playing a move which they have recommended as best, because of fear of having to play against a line which their opponent has prepared against it) and despite the hours which I am advised that many of my opponents spend in trying to discover mistakes in my published variations in "Simple Chess," I nevertheless lost but a single half point with the white pieces in the Open Tournament at Baltimore in 1948. And it wasn't because the boys didn't try. There were my moves open for all to see in "Simple Chess." They could select any one of a hundred different opening variations and I would play the exact moves as published. Is this not just a little significant that white can win? And, if so, why is my favorite opening the Vienna, so damned by faint praise, and so shunned by all the celebrities? You answer that one. I can't. I don't wish to take up space by tournament records. All in all, they could be a lot better, except perhaps locally, inasmuch as I have won every City of Boston, Massachusetts State, and New England tournament in which I have taken part since 1936 - some dozen or more altogether. I will merely say that having played in eighteen national tournaments, including U. S. National, U. S. Open, Ventnor City, and the Pan American in Los Angeles in 1945, I feel that this experience should mean something, and I hope eventually to demonstrate that it is possible to play chess with consistent scientific accuracy. After once again destroying my chances to advance in the annual club championship (note to self: do not move rook to where it can be pinned to queen by enemy bishop), I made a bathroom pit stop before heading home. Me: "So, what's your rating?" Him: "Mine is 1600-something. What was your opponent's rating?" Me: "1500-something. How long have you been playing?" Him: "4 years. How long have you been playing?" Me, after briefly reminiscing mentally about long-gone glory days: "About 20 years." Him, as he's leaving: "Are you on your way up?" Me, with a wry smile borne of self-awareness of weakening chess powers: "No, I'm on my way down." Little Mr. Grown Up, thank you for a highly entertaining, if brief, conversation. It was an amusing end to a chess-wise disappointing evening. I must tell you now that I was incorrect in what I said. I am not on my way down. I just received my latest rating, and I have (again) hit my floor of 1700, so it's only up from here! 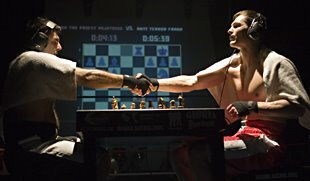 What does it say about the chess world, that Chessboxing is getting better exposure than chess itself? ESPN.com The Magazine is currently promoting a feature entitled "Chessboxing: By Hook or By Rook." The piece includes a 5-minute highly produced video including interviews with chessboxers and action from the recent European Chessboxing Championship. A few months ago, we had an item on Alexandra Kosteniuk, a Russian woman described as the Anna Kournikova of chess. Now we see a story on Arianne Caoili, 19, an Australian player who the Aussie media say is the Anna Kournikova of chess. How many Annas are there in chess? What goes on in those chess clubs? 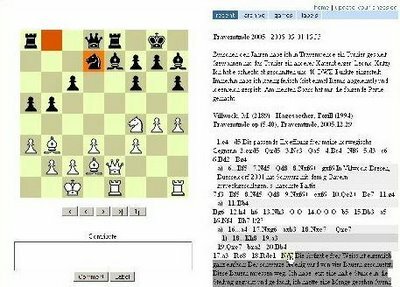 Most chess blogs (including this one) are built on general purpose blogging platforms like Blogger, WordPress or TypePad. When we want to display games or positions we need to turn to chess tools like ChessViewer, ChessPad, ChessBase or the recently launched web-based ChessUp and figure out how to integrate the appropriate html code into our posts. Sometimes this is relatively easy, other times not (of course, the technical savvy of the blogger plays an important role). Martin Villwock of Germany offers his solution to this problem -- chesslog.de, a blogging platform specifically designed to share chess games. Now, it's as simple as pasting in "... PGN files and see[ing] the games visualized instantly". In the bottom left hand corner of the his home page are links to several chesslog.de blogs that you can check out. While I find the chesslog.de platform intriguing, I'm struggling with whether the sites it creates should properly be classified as blogs. The archives do provide a chronological list of entries, but the homepage of each site seems more reminiscent of pre-blogging personal game pages people used to create (still do?). The platform does allow comments but does not currently allow you to create sidebar links. I'd be interested in others' views on whether these sites ought to be thought of as blogs. Blogs or not, chesslog.de is an interesting platform which some of you may find useful. Every few weeks or so there is a story like this about a house full of sick or dying cats, but I never expected to hear about a guy who is hoarding chess sets. If any of the sets have been mistreated, I hope they put him away for a long time (presumably, in a rosewood box). A serial killer detained in Moscow has confessed to killing 61 people of the 64 he was planning to kill — one murder for each of the chessboard checks. Alexander Pichushkin, 32, a shop assistant, has claimed to be the notorious Bitsa Park serial killer, who Moscow police have been tracking down for more than half a year, Kommersant daily reports. Pichushkin, who has already been nicknamed “Crazy Chess Player”, said he had initially planned to commit 64 murders, one for each of the chessboard checks. He also said there were three checks vacant, thus admitting to have killed 61. Awhile back I posted about the controversial proposal to install a giant chess board in Mill Valley, California's Lytton Square. Months later and things are still far from settled, but in a recent move to find a compromise, Mill Valley civic leader John Cuttler has proposed reducing the size of the board from 16 x 16 to 10 x 10. Unfortunately, his proposal was met with swift denunciation by the critics of the plan. "If it's not broken, don't fix it," said Elaine Gentile, a leading opponent who dismissed the new proposal.... "This is like a sacred historical spot," she said. Like a sacred spot? Lytton Square? ... I think you can find it listed right after The Temple on the Mount and the Birthplace of Jesus. It came down to the final round - Jason Spector (2109) vs Scott Didham (1955) in Saturday's Legends: H. Bird tournament at the Boylston club. Scott prevailed and won clear first ($100) with 4 points in a strong field. Jason had to settle for a group tie along with FM Chris Chase, Matt Klegon (2067), and Evan Sonkin (1814). Other strong players included NM Alex Cherniack, NM Chris Williams, Andrew Wang, Kyle Clayton, NM Lawyer Times, Natasha Christiansen and Edmund Staples. Winston Huang took the U1800 prize. Who needs chess clubs and community centers? Players will match up against five opponents in a series of 10-minute games. A no-talking rule has been waived and good-natured "trash talking" will be allowed. Read "Albany bar to host chess tournament" from The Business Review. How come the White pieces look black and the Black pieces gold? If Black's 2nd move was 2.f7-f6, then what was his first move? For the usual reasons (family, work, etc.) I've not been able to play much at the club over the past couple of months. So, having a few free hours on Saturday I decided to stop by and check out the Legends of Chess event. Little did I realize that in the intervening weeks the club had been moved to New Orleans! Well not really, but it sure seemed that way. Apparently we have been experiencing rather significant flooding issues in our basement location. Eastern Massachusetts has had one of the wettest springs on record this year with several bouts of flooding along local rivers. In fact, some claim to have seen various species of rats and mice lining up in pairs along Holland St. While Davis Square isn't in the flood plain, the local water table has reached a level where additional rainstorms cause water to seep up through the foundation into the basement of our building. As a result, the carpeting in the club has been soaked through several times. On Saturday, the space seemed serviceable enough but far from ideal. Only one or two spots in the main playing room were really wet and the backroom seemed fine. On the other hand, the musty smell of wet carpeting was omnipresent. Given the heat of the day, I suppose the moisture offered some relief, though in a wet, clammy sort of way. The activities of the club are continuing on schedule and Saturday's event had a normal turnout. Nonetheless, the situation is obviously in need of a remedy. I'm sure it will be a major topic of discussion at this week's BCF Board meeting. What is former Boston Celtics star Larry Bird's favorite opening as White? Why 1.f4, of course! Learn about this and much more in this article about Chess-savvy NBA stars. I thought Jason's comment on the Chess Life item was worthy of its own post. At the very least, consider this an open thread to complain about or compliment the format of this year's US Championship. I personally like the new redesign of the Chess Life, although the problems in Soltis's column should not be blue boards on a blue field! I strongly disagree with comparing NIC to Chess Life -- I feel they have different target audiences. For example, I think Chess Life is not designed as a place for the stronger players to learn about the newest theory or the latest relevant game to their favorite openings. Chess Life, as I have always seen it, is there to showcase American chess and is more generally geared to players in the B-E classes. The changes to the design seem to strengthen that view. The other redesign of Chess Life is the new focus on web content, where Chess Life has been way behind other places. It remains to be seen how good the web redesign is, but they clearly have the vision to relocate much Chess Life content to the web, which will hopefully enhance both the magazine and the website. Now, Paul's complaint about our team getting snubbed in coverage in Chess Life is a big-big problem. As I said, Chess Life should FOCUS on American events. Growing up in the South, I always cherished my Chess Life to tell me about the local heroes from around the country. For example, they should do much more coverage of all (or many) the state championships (and Am. Team events! ), as they once did fairly well. I do hope they begin to focus on that again. Finally, the US Championship needs a complete rehaul of its format. This should be discussed in Chess Life, and on this blog, and we should protest for major changes. ...they were playing "road chess". Their cars were covered with these incredibly tall and beautifully built structures that made them look like chess pieces, and they would move around the "board" by speeding up, slowing down, or changing lanes. In high school, [Angelique] joined her chess club and rocked it. She wound up competing for Singapore in a tournament against Malaysia. Still, she insists she's not that good. "It was just a fun intellectual exercise," she says. "People pour money into coaches and training; it's a career for them. Chess is really frightening." So I know what you're thinking ... "hey DG, how long have you been reading magazines for teenage girls and have you discussed this behavior with your therapist?" Actually, things went down more like this ... "hey Dad, check out this article in my magazine. It's about blogging and chess. Maybe you can use it in your stupid chess blog." At age 14, Yi Song received the women's master title and that year was ranked the 10th best woman chess player in China. Today, she is a graduate student at the University of Delaware. In addition to her studies, she coaches kids on UD's College School chess team. However, she has learned that she can't simply replicate the techniques of her former coach in China. "There's a cultural difference between American and Chinese kids," Song said. "When I was with my coach, he often made me cry but you can't do that here." Read "Grad student chess champion in China and Delaware" from UDaily. 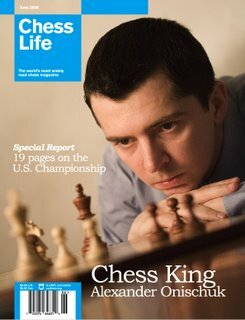 Those of you who have received the latest issue of Chess Life are probably aware of the recent changes in format and content. I did my usual skim but still found no reason to spend more than about 10 minutes with the issue (no change there). To be honest, I wouldn't subscribe to Chess Life except that it is a "benefit" of USCF membership. I do pay to receive New in Chess and spend many hours with each issue. Grandmasters have concluded that staying in good physical shape is critical to performing at the top level of the chess world. As a result, many run, swim, play tennis, etc. But have you ever considered whether playing chess would benefit physical athletes? The Basketball Player Development & Human Performance Enhancement blog shares an excerpt from a Sports Illustrated story about a competitive Tennis player who uses chess as his cross-training activity. P.S. Perhaps we can ask Mate in Three if chess helps with his cycling. Not a highjacking this time, but I did come across this blog which seems to be "borrowing" quite liberally from Dennis Monokroussos' The Chess Mind. The best thing for chess since Bobby Fischer?! ...I quit chess last year due to nerdish puns made. I'm that low down on the food chain [that] I don't need chess to place me even lower. At my top hat they describe a person who plays a variant that I guess you would call "mindless chess." Well, he doesn't really play chess... when it's his turn to move he goes to the Hint option where a faint red arrow suggests which piece to move where, every time. Every time it's his turn to move "Menu -> Hint". While there are exceptions, most future Grandmasters start their chess training when they are young. It seems that the Chess Boxing community believes that the same principle holds true for their sport. Check out these photos from Chess Boxing Club Berlin. THE heart of an Australian chess queen at the centre of a dance-floor brawl between two grandmasters appears to have been captured by one of the errant knights. Fess up ... which one of you was involved in the Aronian-Caoili-Gormally tryst? Apparently everything in life can be boiled down into a 2x2 matrix, at least according to 4-Block World's Tom McMahon. Here's 4-Block Chess; check out his archives for other 4-Block concepts. It's all over the mainstream press and the blogosphere, so I was trying to think of something unique to say about L'affaire Gormally. How about this? Lev Aronian and the Armenian team faced many challenges on the way to winning the Chess Olympiad in Turin, including a new variation of the English Attack. My German is only as good as Bablefish's translation algorithm, but I think Schachblatter is proposing a tournament among the German chess bloggers. Meanwhile, PokerStars is organizing the World Blogger Championship of Online Poker. Our own DPJ is participating. Rocky Rook has launched a dedicated chess blog through which he has joined the Knights Errant clan. Welcome Sir Rocky Rook. ...what do maria sharapova, the russian national soccer team and the russian chess olympiad team have in common? the tennis pin-up girl was just eliminated from the ongoing french open, guus hiddink's new charges failed to qualify for germany 2006 and the hot favourites for the recently concluded chess olympiad in turin fizzled out and eventually finished a dismal 6th. Before everyone becomes enamored with Joshua - The Chess Playing Robot, consider how things could go very wrong. his new eyeglass prescription before the tournament. Source: "Tourney contestants clash in 'sport for the mind': ISU chess event draws people from five states" from the Pocatello Idaho State Journal. At Kosteniuk.com, readers have rated Sanja Dedijer of Bosnia Herzegovina the most attractive player at the Turin Olympiad (much higher than Alexandra herself). I couldn't agree more! I dreamt we were in Paris, dancing on chess-boards and thinning ourselves out between the wooden kings and queens. Should Forfeiters Lose Rating Points? Because of my recent experience at the 2006 Mass Open (see my previous post), I am wondering what might be done about last round forfeiters. Should forfeited games count by the USCF as a rated game, and would that cut down on forfeits? I have examined both the Marshall Chess Club and the Boylston Chess Club's last 6 months of tournaments in order to estimate the prevalence of last round forfeits. For the BCC, there were 3 forfeits out of 19 tournaments so far this year, which means 15% of all events have a forfeit. 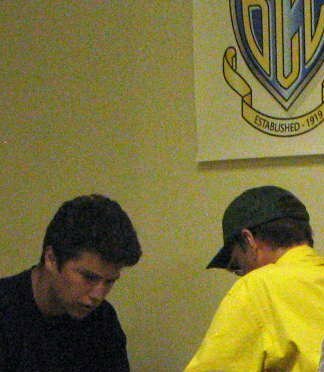 For the Marshall Chess Club, the rate was similar -- 9 last round forfeits in 45 tournaments (20%). This means that a player is getting robbed of a last round game once every 5 events. This may seem like a small number to some, but considering that this kind of forfeit results only from the rudeness of players -- if a TD were told about it, they would simply be withdrawn from the event -- I was rather surprised at how common this was. When you consider that these are the rates for well established clubs, with many many regular players, this is outrageous! Let me address one concern -- is it right to rate a game that went unplayed? I say, "Yes," because we have no problem rating a game if our opponents resigned after a few moves, or offered a draw on move 2. If a player walked out of a game after the moves 1.e4 c5 showed up, this would count as a full point, but that is hardly a real game. In both cases, one player has to sit and wait, wasting time and life for nothing. The real question is -- would rating their unplayed game lead to fewer forfeits? I suspect it will, but I welcome comment. If it wouldn't, then there is no point in rating the game. But if it would lead to more repairings then I think it is worthy of consideration. I suppose other options include sanctioning or banning players who forfeit games from club play. When FIDE Chess in Chicago evolved into the North American Chess Association, a post on their blog pointed readers to the new North American Chess Association blog. During the recent Spring FIDE Invitational tournament, posts on the new blog were frequent. However, if you go to nachess.blogspot.com today, you'll find that it is now a spam blog entitled my names is Tyler Wright (WARNING: some of the links are definitely not family friendly). Did North American Chess abandon its blog voluntarily or have sploggers figured out how to steal existing blogs? Whatever the answer, if you have a link to the NA Chess blog on your site, I recommend removing it. Update: Sevan confirms the highjacking and reports that the blog can now be found at www.nachess.org/blog.html. Manouchehr Mottaki, the Iranian foreign minister, described the difference in approaches on a trip to Armenia in February. "Americans really love American football, the main aim of which is attack," he said. "But we have a cultural preference for chess and we approach problems calmly, taking account of all the circumstances." Perhaps we should simply take on the Mullahs in a chess match in order to settle our differences. Competing on the same side. Attacking on opposite wings. That's right, we're talking about ... Sailing -- Like chess only wetter. When asked how many moves he thought ahead, Bogoljubow pondered for a second, flashed his teeth and said "Just one. The best". Commenting on a recent run of victories, he said "When I play white I win because I play white. When I play black I win because I am Bogoljubow."